If you want to make even a little change START now and register your NPO. A NPO is a non profit orginisation and is mostly used to help those in need as the Government has a huge task in providing basic services to communities. If you have the desire to help the less fortunate in providing feeding schemes, giving assistance in primary care, educational upliftment, skills development, churches etc.or whatever your passion is and believe me there are so many areas where basic help and needs are. The group will receive their NPO number within a few days after application has been submitted. It is clear that government can not do it alone. It is therefor critical that NPOs must assist government in dealing with the huge needs in our communities. 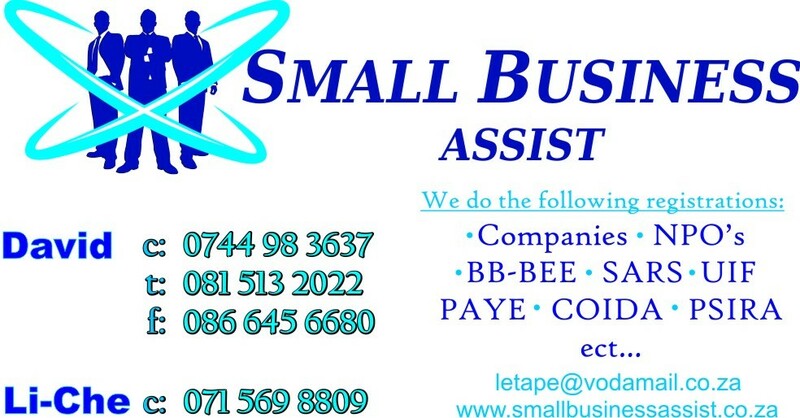 Small Business Assist will apply and draft your constitution for your NPO. All you need to do is sit back and tell us you vision and mission.